The way you place your hands on the grip of the club provides the only direct proxy available to you for actually hitting the ball. Indeed, the club itself is the one striking the ball and the only link between the club and your body is through your grip. As with most things golf related, there are many options available to you. Notably, the type of the grip can vary as well as the relative strength and finally the way you position your left thumb on the grip also varies. These options are explained below. The grip type most widely used is the overlap grip, also known as the Vardon grip that got its name from the famous golfer that popularized its use (Harry Vardon). This grip setup is suitable for most golfers. However, junior golfers or those with small fingers may find it difficult to overlap the pinkie in such a way as to securely hold the hands in place together. The interlocking grip involves looping the right hand’s little finger around the left hand’s index finger. This type of grip provides a very strong bond between the two hands and constitutes an excellent alternative to the overlap grip. Finally, the baseball grip – as its name suggests – involves placing both hands on the grip of the club as you would if you were holding a baseball bat in your hands. Indeed, this grip type calls for your two hands to be pressed against each other without any actual link between the two. No overlapping or interlocking fingers here. 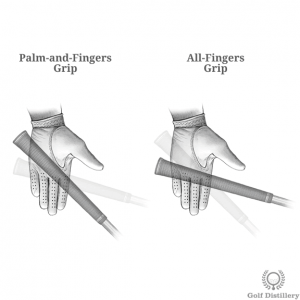 This grip type is best suited for junior golfers or those with finger or joint issues that prevent them from swinging the club comfortably using any other method. The type of grip you end up choosing does not translate into direct effects onto the ball and is more a matter of personal preference. The way your hands and fingers are aligned in contrast to the center of the grip is called the grip strength and there are three main variants. The default grip strength is the neutral grip. In this instance, the thumbs of both hands are resting more or less on the top – or middle – of the golf grip. The Vs formed by the creases between the thumb and index fingers will point towards the right side of the golfer’s head. This type of grip does not tend to favour one type of ball flight over the next and can be considered suitable for most golfers. Golfers wishing to favour a draw in their shots’ ball flight will tend to move to a stronger grip. This setup involves rotating both thumbs – and hands – away from the target on the grip (or clockwise). 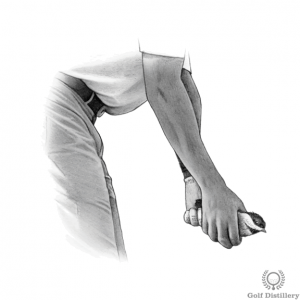 The Vs formed by the creases between the thumb and index fingers will then point towards the golfer’s right shoulder. Finally, golfers wishing to favour a fade in their golf shots will likely move to a weaker grip. This setup involves rotating both thumbs – and hands – towards the target on the grip (or counterclockwise). The Vs formed by the creases between your thumb and index fingers will then point to the left shoulder. To recap, contrary to the grip type options available which have no real impact on your golf shots, your grip strength has a direct impact on the ball flight of your golf shots. 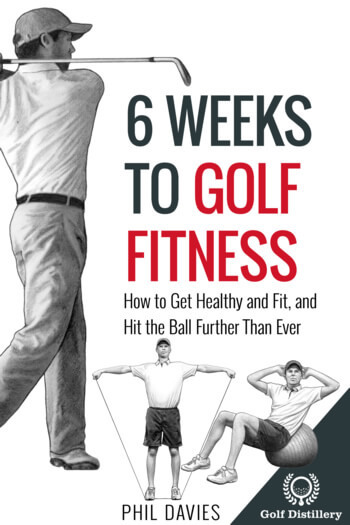 You may choose to move away from the neutral grip strength if you are looking to favour one ball flight over the next or if you want to move away from a ball flight you are trying to avoid. Regardless of the wrist strength chosen you will need to pay careful attention when you are actually assuming the correct grip position. 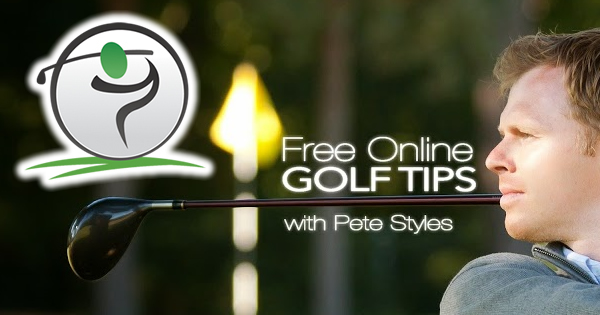 Indeed you should carefully place your hands on the grip while the clubface is pointing to the right direction at address, which will likely be square to the target. An error people make is they weaken or strengthen their grips by rotating the club clockwise or counterclockwise after the hands are already clutching the club. This is in contrast to rotating the hands on the grip itself, which is the correct thing to do. Rotating the club at address will almost surely fail to produce the desired effects as the club will rotate back to its normal position while you are swinging the club, which will lead to an open or closed clubface at impact. Long Left Thumb vs Short Left Thumb? 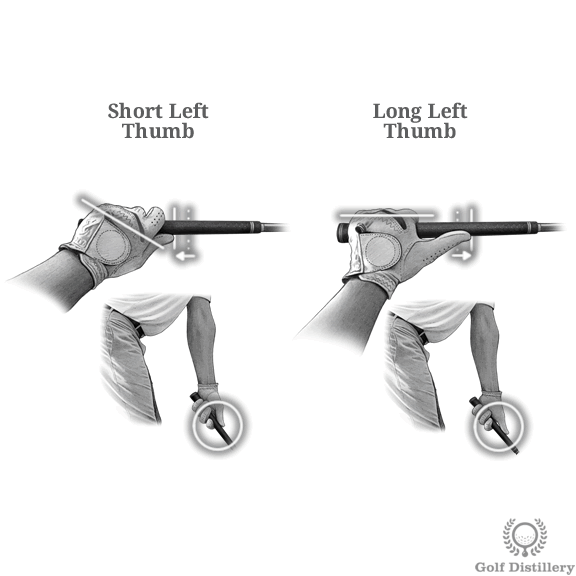 How you actually position your left thumb (top hand) on the club will lead into another set of options for your golf grip. Indeed, you can either position it so that it extends onto the grip or you can leave it somewhat recessed. The first option – the long left thumb grip – sees the thumb extending far down the club’s grip. Such a such grip is easily recognizable in that the end of the thumb will extend much further out than the rest of your fingers. This finger setup tends to lead to an All-Fingers Grip, which is explained in the next section. The second option – the short left thumb grip – sees the thumb huddled close to the hand in contrast to extending out far. It is easily recognizable in the the end of the thumb barely extends further out than the left index finger on the bottom of the grip. This setup leads to a palm and finger grip which is explained below. Lead by how you place your left thumb on the grip there are two main ways you can position the grip inside your left hand itself. 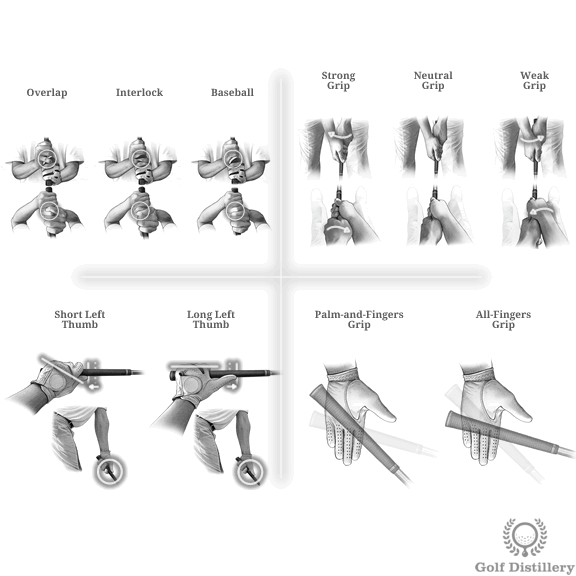 The first option – the all fingers grip – sees the lower part of the grip pressed underneath the first knuckle of your fingers all the way through, from the index to the small finger. 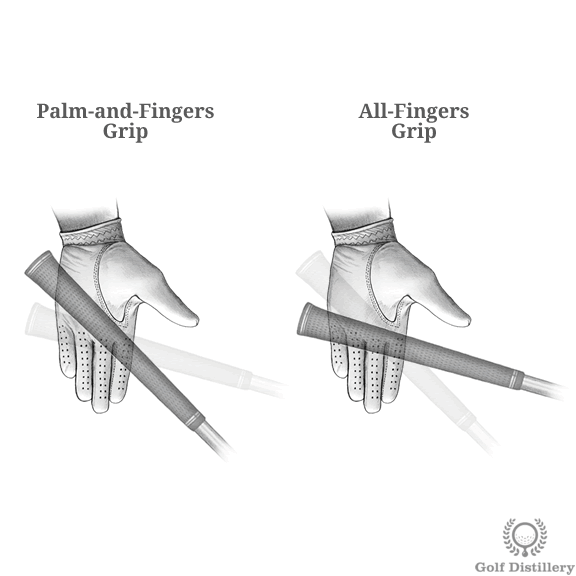 The second option – the palm and finger grip – sees the lower part of the grip of the club pressed underneath the second(middle) knuckle of the left index finger. The top part of the grip will be pressed against the padded portion of your palm and the grip will line up between these two end points. Although there are many options to consider in how you place your hands on the grip of the club, there is only right way in terms of grip pressure. Indeed, whatever grip strength, grip type or left thumb position you use, your grip pressure should be on the soft or light side. The two common mental images that are used is to imagine you are holding a live bird in your hands, or alternatively that you are holding a tube of toothpaste. Gripping too tightly would hurt the bird, or would see toothpaste leak out of the tube. A soft grip pressure promotes feels, allowing you to better feel what your club is doing and how it comes in contact with the ball. 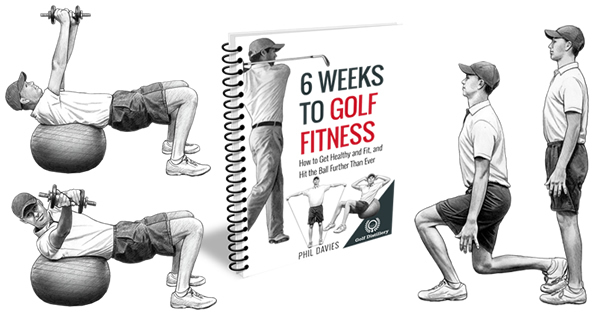 It also works to eliminate muscle tension which could create havoc in the golf swing.